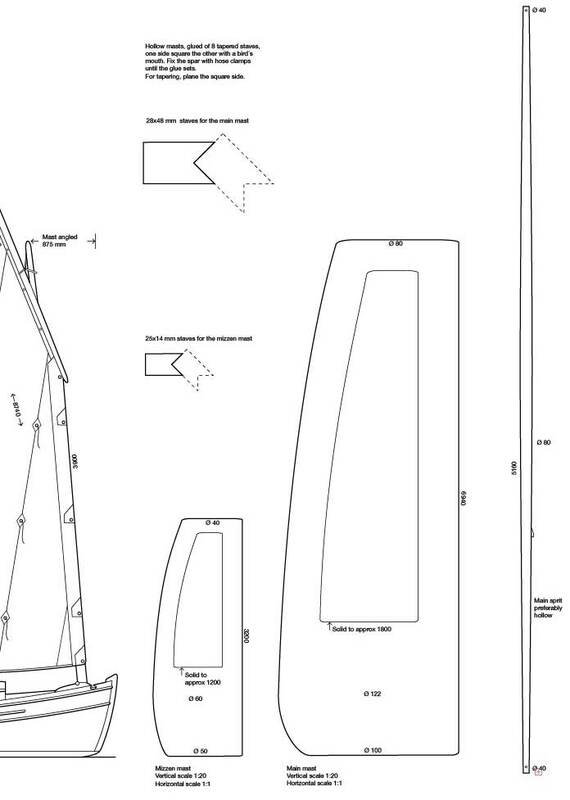 Sharpie 600 is designed as a daysailer and weekender, a use most boats are put to, regardless of their design purpose. Daysailor for many: Roomy cockpit (< 200 cm) Comfortable under sail and in a harbor. Everything within reach without passengers being in the way. No boom above the cockpit (with the lug rig). Flexing masts reduce heeling in a gust (also the lug). Easily lowered masts in a tabernacle (gaff rig). Weekender/Cruiser for two: Comfortable for one, acceptable for two. Provisions for basic cooking. Room for a portable toilet. Usable in bad weather. Some kind of heating for use in early spring or late fall. Fast: Fast enough to cover considerable distances in a day. Lots of sail (SA/d=21) for ghosting along in a breeze without having to resort to an outboard motor or oars. Safe: Self-righting after a knockdown. The lug rig reefs without affecting sail balance. Ability to beat away from a lee shore in a blow. If possible unsinkable (with built-in positive flotation). Small and handy: Should maneuver calmly and smartly under sail, motor or oars. Short, narrow and light (d/l=159) - easily handled on and off a trailer. Low moorage fees - if applicable. Draft not more than 25 cm, allowing sailing on to the beach and drying out upright on the sturdy flat bottom. The rudder and centerboard should lift without damage if you hit bottom. Pretty: Pretty in a traditional way, under sail and on the beach. To maneuver calmly and smartly under sail, motor or oars. Low maintenance: Modern wood. Epoxy/glass-sheathed plywood. No permanent installations: electricity, plumbing, motor etc. If fitted with a motor, an outboard is recommended, preferably in a well (but a few Sharpies have been fitted with a small inboard motor under a bridge deck). Easy trailering. Easy to handle: All conceivable maneuvering on land or in water should be possible for a competent single-hander. With the gaff rig, the mast in a tabernacle should be easily lowered for passing under a bridge, while the lug rig masts are light enough to be handled manually. Easy to build: Designed for amateur construction, the Sharpie is built on 7 transverse and 2 longitudinal bulkheads, preassembled like a large jig-saw puzzle. To this, bottom-, planking- and deck panels, sheathed in epoxy/glass are glued. The Sharpie 600 took the third prize in Classic Boat´s design competition in 1996. Look at the photos of Bernard Goffin's gaff rigged Sharpie 600 to see the building process. The plans show either the lug or the gaff rig and this must be specified when ordering. Both are a bit unusual today, but are excellent on small shallow-draft centerboard boats. They were very common earlier, being easily handled, simple to set up with a minimum of technical gadgets and comfortably sailed singlehandedly. The mast of the gaffer sits in a tabernacle and can be lowered and raised in minutes to pass under a bridge. Since most sailors are used to one-mast boats it might seem less challenging than the lugger. The gaff is a way to increase the sail area on a shorter mast and thus reduce weight aloft (the same way full extended battens increase the area aloft on a modern competitive mainsail). A gaff mainsail can be lowered or reefed without pointing the craft into the wind (let go of the throat and peak halyards and the sail comes down regardless of the wind direction). The gaff rig is not as efficient close hauled as a modern rig but makes up for it reaching and running. The lug is an even older type of rig, with several interesting advantages. There is no boom to avoid when jibing and no sail flapping in you face when you stand up in the cockpit. With two masts it is excellent for precision maneuvering under sail; go sideways or backward to a quay, or to turn on a dime. The unstayed masts bend a little in gusts, instead of boat heeling over. The light masts are easy to lift in and out singlehandedly – but of course not as easy as lowering the tabernacled gaff mast. The lug rig was very popular hundred years ago on coastal workboats around the world: efficient, simple and easy to handle with a minimal crew. The lug rig was my first choice for the sharpie since I was very impressed with the performance of the lug rig on my canoe yawl a couple of years earlier. But many interested builders were not quite confident with such an archaic rig, and I got questions about an alternative. So I drew a gaff sloop. Now, after 15 years, the gaff rig counts for approx 2/3 of the shipped drawings. Many seem to choose the gaff for aesthetic reasons: it looks more ship-ish. The plan set consists of six sheets (A1 size = 23"x33") with all the information a builder with some experience (e.g. kayak or canoe building) would need to build the boat. Inexperienced builders may need to consult books in basic boatbuilding techniques. The boat is built with plywood – a simple and quick way to achieve strength and a smooth finish – double 12 mm sheets on the bottom, 12 mm on the sides and 9 mm on the deck and house. Wood strip construction is an alternative – though it will be more time-consuming. The plywood sections and longitudinal bulkheads fit together like a large puzzle, creating a super-stable 3D grid, joined by epoxy fillets. The image above shows the lug version. The ballast is lead sheet glued/screwed to the floor (a thrifty builder without access to a commercial lead-casting foundry perhaps could do the job himself, using old lead tire weights or scrap lead, a charcoal fire and a simple mold – a particle board with wooden battens – but check the environmental policies in your area!). Note: The gaff and lug version are on different plans. Please specify which you want when ordering. No building manual is included. For more information on building techniques, please consult one of the books on boat building listed in literature. I frequently get questions about the off-center board, positioned 30 cm to the right of the centerline. It means that the centerboard trunk that usually transforms the cabin of shallow-draft cruisers into two narrow and not very usable spaces is now out of the way, hidden behind the longitudinal bulkhead. The Sharpie 600 is surprisingly roomy. "But won´t she sail better on one tack?" In practice, you must be a very good sailor to be able to notice any difference. In the good old days, the centerboard was often placed through the planking beside the keel as boat builders did not like cutting holes in the backbone. Thus, my Sharpie follows a respected tradition, although the offset is slightly more than the older custom. The photos below (from Audun Bull in Norway and his S/Y Kuling) show the surprising space that can be achieved in a tiny pocket cruiser when the centerboard is hidden behind the pantry counter. If someone wants to put sailmarks on the sails of their Sharpie, here are a couple of suggestions. They are available as downloads on the resource page. The color can be adjusted to suit the color scheme of the hull. The Sharpie 600 started as a private project - an idea for a very simple, hassle-free, inexpensive and convenient way for me to spend time at sea. When the design was nearing completion in 1996, the UK magazine Classic Boat launched a design competition with almost the same specifications as those I had set for myself. I submitted my design in the competition and was happy to see that the Sharpie 600 was honored with a third place award. "Björn Thomasson's flat-bottomed 'weekender-for-two' appealed to me for its charming simplicity. At a personal level, I am not entirely comfortable with the asymetry of the off-center board and mizzen. Hang the rudder in a slot to allow for a central mizzen and centre the board and this little lug-rigged cat yawl complete with two-berth cabin, head and galley, would be just right fo a drying mooring. The high aspect ratio lug rig certainly suits the little boat. Allowing for my personal prejudices, I gave it a third place." By the time the competition ended I had discovered that kayaks were an even more efficient way of spending time at sea, so the prototype was built by Wermlandia Båtproduktion and exhibited at the Stockholm Boat Fair, where she attracted a lot of interest from sailors, journalists and boatbuilders. To date (Summer 2017)41 sets of plans have been shipped, but I am still waiting to start building my own Sharpie 600. There have been a lot of kayak projects in those years. Sometimes someone voices strong views on what can be allowed to be named a sharpie, and we, who design modern sharpies, are reprimanded for lack of traditional uprightness regarding nomenclature. Real sharpies are long, low and narrow, were nailed together with tongue-and-groove boards and sported two masts with triangular sails. They were fast and more seaworthy than the appearance might suggest. Room under the deck was nothing more than a joke. Standing height in the cabin required a hull length of 15-16 meter – and even then it looked like a high shed on deck – but on the other hand, it was cheaper to nail together a 16-meter sharpie hull than to build traditional 9 meters "normal" sailing yacht. Most of the had centerboard and you could sail up to the beach and disembark with dry shoes. The type is considered to have originated in New Haven in the early 19th century and migrated down the east coast while evolving to suit the local conditions. My sharpie is too high, wide and short to be a "real" sharpie, according to the defenders of the traditional sharpie. But I am in good company (Phil Bolger, Bruce Kirby et al). The world of sailboats is full of short, wide, and high sharpies – while the "real" ones are displayed in museums. The advantages of the sharpie hull are too good not to be used and developed. The photos below show the old original sharpie. It is from New Haven and the end of the 19th century. One of the better-known versions of the traditional sharpie concept, is Commander Ralph M. Munroe's "Egret", an 8,6 meters long sharpie, based on the classic lines but adapted för pleasure sailing in Florida. Designed in the end of the 19th century, it has been built many times (plans are available from the Wooden Boat Store) and has inspired many interpretations.